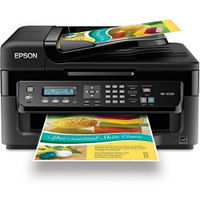 Find the finest remanufactured Epson WF 2530 ink cartridges at budget-friendly prices from 1ink.com. These remanufactured ink cartridges utilize recycled Epson printer cartridges that have been refitted with new components and refilled with the highest-tier printer ink. Whether you need a replacement cartridge for your home printer or a full restock of Epson WF 2530 ink cartridges for the office, 1ink.com can save you money while delivering high-performance printing supplies. Quality is our top priority at 1ink.com, so we believe in providing the best printing products at the lowest prices available. We put every Epson T200XL ink cartridge through a specialized quality-control test to ensure that our remanufactured ink cartridges stand up to the original equipment manufacturer (OEM) standards. Whether you’re printing legal documents, business reports, or high-resolution photos, there’s no room for error when it comes to ink performance. With a full 1-year warranty, 1ink.com guarantees quality ink cartridges that produce outstanding print work in your Epson printer. Contact our friendly customer service team if you need assistance finding the right ink for Epson WF 2530 printers. They’ll be happy to put our many years of experience and knowledge to good use to help you find whatever you need. You can also buy in bulk thanks to our free shipping and handling offer on orders over $65. At 1ink.com, we make it easy to save money on quality remanufactured ink cartridges. We’ve been selling ink for almost two decades, so you can feel confident that you’re buying from the best.